Have a GREAT flight home!!! Relax a bit, and get ready for the Rox or the Phils! I KNOW you and your mates will be ready for either team!!! Matty, we are all going CRAZY, so proud of our boys in blue, cannot WAIT to see ya’ll back at Chavez RAvine! I’m sooo super happy for you guys!!!!!!! Way to prove all the ‘experts’ wrong. Make sure to give Dre a hard time for coming up a single short of the cycle. Look forward to seeing you back here! Great series Mr. Kemp and congrats on the sweep. i too am baffled by the popular view that dodger pitching isn’t great. Clayton/Wolf beat out Carpenter and Wainwright, Padilla didn’t give up a run and our bullpen is ridiculous. If you and Furcal continue to set the table like y’all did against STL the Dodgers are going to the World Series. Keep ballin! Congrats Matty! Your shot in Game 1 set the tone. I saw how questionable some of those pitches called for strikes were in your AB’s. Keep your head up though and don’t let’em get you frustrated. As long as you lay off that slider low and away your a monster out there. Keep going the other way and play your game not theirs. Before these playoffs are over, everyones is goin to know who #27 is! its ok matt! u’ll do better at dodger stadium because i’ll be there waving my “KEMP IS MY HOMIE” blanket!! love u guys!! we got it in the bag! LA!! woo!! You guys are AWESOME!!!! We are so proud of our boys in blue!!!! We will be happy to have you all back home soon!!!! Matt, you guys are an amazing group. We’re so proud of what you guys have accomplished this year. Keep up the good work! We’re looking forward to seeing our boys in blue in the ‘series. GO DODGERS!!!! Just know we popped champagne for you guys tonight, Matt when me & my best friend went out tonight. You just don’t know how hard we were cheering for you guys here in LA. I honestly KNEW you guys had it in the bag…I was only expecting a quick trip to STL, watch ya’ll wrap it up in a day and get back to where you belong; back here with us! Safe flight home & AS ALWAYS know that Dodger fans always go HARD for our boys…no other team should expect to come out of dodger stadium unscathed. Did you like how Cardinal fans BIT OFF US with those imitation towels?? hahaha! PSSSH! Dodger fans= Always imitated, NEVER duplicated. Congrats again, Matt! You DESERVE it! Matty, we were popping champagne tonight just like you guys and spraying it around the house. What a feeling, You guys are awesome, and we will not stop believing until it is done. You guys all deserve a championship, you have played like champions and most important a team! Go blue! Ha ha, this clubhouse photo of you pourin’ milk on that poor reporter is HILARIOUS! Just an awesome series Matt! The intro HR in Game 1 HR was HUGE – so huge it instantly crushed the hopes of dem Lil Red Birdies. In fact, the same thing repeated itself yesterday in Game 3 with your first inning infield hit (that was some nice hustle to beat it out) and then scoring the first run of the game on ManRam’s RBI double. Otherwise Mattie, stay loose and relax over these next few days off. Most importantly keep the fun times going both on and off the field! I’m feelin some mo postseason wins on the way! Hey Mattie, one more thing… what dance are you doing in this photo (link below) – part of your pregame warm-up “stretches” in SF?!? Yeah, your BISON BOY was busting out some moves on the grass during warm-ups before the Sept. 11th road game up in SF last month! You guys are awesome! Can’t wait for the next round to begin. YES we were going crazy back here in SoCal! I have ALWAYS been a proud Dodger Fan but yesterday my chest was more puffed than ever! I love you guys and THANK YOU again for another great win! This season just gets better and better! See you on Thursday! YOUR DODGER FANS ARE READY!!! MUAH! Congratulations on a great series victory. This team has reminded me of the 1988 team all season long. They had that ability to pull games out that seemed lost and everyone on the team had their moment to shine and contribute. I really feel the 2009 Dodgers are a team of destiny. I can’t wait for NLCS to start. Great series Matt!!!!!! The Champagne here in Central California hasn’t been popped yet. As a matter of fact, it hasn’t moved from it’s spot on the piano since you won the division. We are waiting for you guys to win it all so we can pop the Champagne as 2009 World Series Champions. It will be especially sweet since we live in Giants country up here. I am so proud of you guys. All that hard work paid off. Well 1 team down 2 to go. This time lets go all the way. Go Blue Go Dodgers. 8 Wins left to conclude the Unfinished Business. Great job sweeping the Cardinals. Now forget about it, put it behind you, and keep working toward our goal: Winning the World Series. Welcome to Blue October! Go Dodgers! Care to explain the “Beast Mode” tees? I saw Pierre wearing one too last week. Way to go guys! There was never a doubt in any real Dodger fans mind that you guys would do anything other than a SWEEEEEEPPP!!! You bet we popped the champagne. proof is my last pic of my latest blog. I saw the “Kemp is my homie blanket being waved at the stadium. Where did you get it? did someone make it for you? 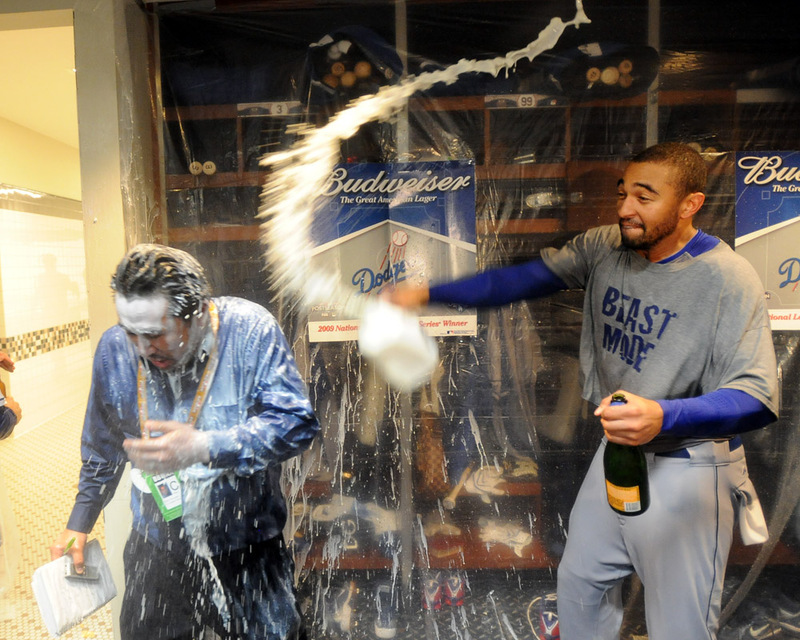 I thought it was champagne that Kemp was spraying the reporter (is it Hernandez?) until you mentioned is milk. I did not catch that the first time. That is hilarious! You are doing fine Matt! Keep on being a great spark plug! I watch from Germany (with US Army) and love watching you play. Keep your eyes off of those down and away pitches. GO BLUE! Milk, that is funny! We will be there waving those towels and screaming our heads off. Wouldn’t miss it!! Have a great time and enjoy every minute of it. Thanks for the updates Matt, I can’t seem to put my blackberry down these days. GO BLUE!!!! Wow! We were popping champagne here in Las Vegas for the Dodgers!!! We loved seeing you Matty Mat (our nic for you) Eith, Lonely, Dewitt(and others)…up here in Triple A Vegas. (we miss you now, the new young Dodger players, now that the AAA has moved) We knew y’all were going to be awesome in MLB!! Congrats to you all! Champagne on ice for next series! GO DODGERS!! Kemp – you guys ROCK!!! Last year is all but forgotten. This is the Dodgers year to do it. Congratulations Matty! You guys have accomplished another goal for the season! I knew you guys had it in you but still can’t believe it was a SWEEP! Just know that the Dodger fans are 110% behind you guys and are ready for Thurs/Fri…I will be cheering my heart out in the stands Friday! Matt, who is that sportwriter getting doused with the bubbly? I hope it’s Kevin Baxter… I hope he’s still blind from champagne burns to the eyeballs. Oh, not nice huh? Well, too bad. He deserves it.